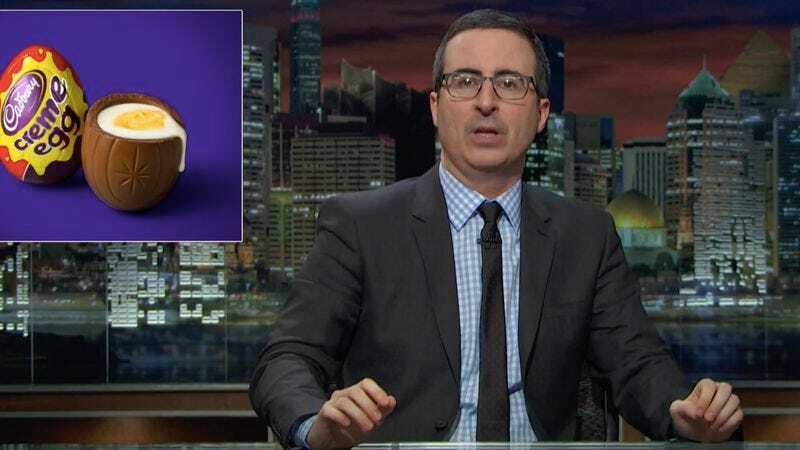 John Oliver took yesterday off for Easter, but he made sure to leave his fans a little something to chew on while they wait for his next episode. It turns out that Oliver is a big fan of YouTube conspiracy videos, those weird, DIY productions that explain to you how the Denver airport was designed by the Illuminati or that Katy Perry is actually JonBenét Ramsey. Oliver decided to make a YouTube conspiracy video of his own, about Cadbury Creme Eggs. Which sort of makes sense; how does the grossest seasonal confection this side of candy corn keep selling? The fix has to be in somewhere, right? According to Oliver, Creme Eggs are part of an elaborate web of secrets involving German gold and Miracle On 34th Street. Follow him down a trail of logical leaps that almost, but don’t quite make sense, until you realize that much like the Denver airport, Creme Eggs is also a tool of Illuminati control. Open your eyes, people.